The entire black-and-white art from the eight page story, "Who Will Cut My Hair?," a classic POPS BRADLEY strip by PETER BAGGE (with ink assists by yours truly). 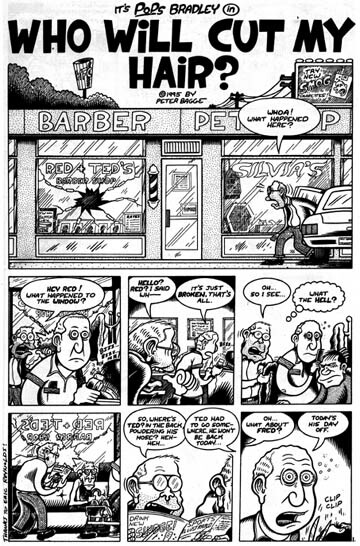 This story appeared in HATE #20, and is one of the best from the series entire run, when Pop meets the Hip-Hop Barber with the Backdoor Flat-Top. The original art is eight pages, each india ink on 14" 17" illustration board.